On July 12, Vogue announced its partnership with Nike’s Jordan brand on the two sure-to-be-iconic sneakers. The collaboration features two reimagined sneaker designs inspired by Vogue‘s editor-in-chief, complete with her four-letter seal of approval etched on the soles. The AJI Zip AWOK comes in two colorways called Sail and University Red, which is what Wintour wears in the teaser video. 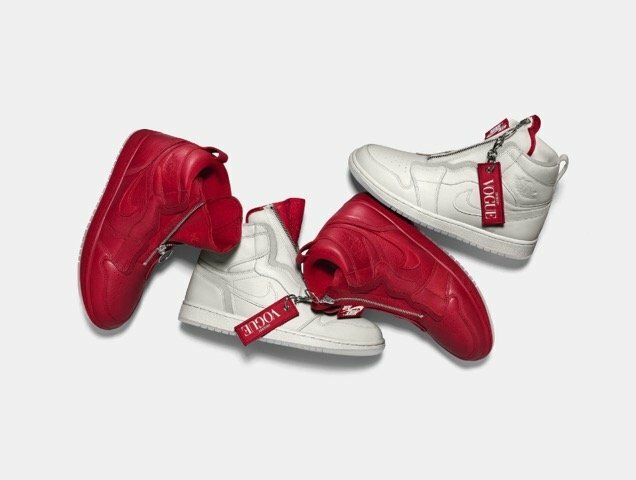 Both feature an ultra soft leather upper material with the famous Swoosh logo, a crimson tongue and bold metal zippers with a red air tag that says “Edited by Vogue” in clean embroidery. The high-tops dropped July 21 at select stores, such as Nordstrom x Nike, Kith, Hirshleifers and two Jumpman locations (Toronto and Chicago). They were also released a couple of days later on the Nike SNKRS app. The AJIII SE AWOK, on the other hand, comes in black and red and is inspired by Wintour’s signature Chanel tweed suits and sunglasses. It drops September 7, coinciding with New York Fashion Week. Both designs are priced at $220 and come in a premium box that includes two suede dust bags. But obviously, those fancy extras aren’t what make the sneakers worth getting. It’s the fact that each design is AWOK’d. Because if it’s AWOK’d, it’s GOOD.